The insurance policies that Las Vegas motorcyclists purchase is almost identical to auto insurance drivers purchase, with the big difference being cost. 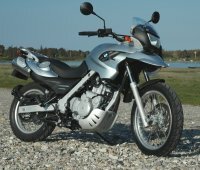 Often times, motorcycle insurance costs much less than car insurance, although they provide the same types of coverage. If you are in need of any information regarding insurance coverage policies, be sure to contact Accupro Insurance Service. Since Accupro is an insurance broker, they have the ability to help you customize your insurance coverage, from the amount you are able to afford to the specific details of what you want covered. They can also refer you to different insurance companies so that you can find the lowest rates and coverage capabilities. There are many types of motorcycle insurance policies, and it is important to know exactly what your policy covers. Be sure to know what type of coverage you have so you can decide whether or not you want to include certain coverage, remove coverage or if you have further questions regarding motorcycle insurance coverage. Below is a list of motorcycle insurance coverage policies and terminology that will help you decide which insurance is right for you. Liability: This coverage protects you if you injure someone else or damage someone else’s property while operating your motorcycle. You must be legally liable for the injuries or damages to activate this coverage. There is also guest passenger liability coverage for any person who wants to become a passenger of a motorcycle. Collision: Protects against damage to your motorcycle resulting from a collision with another vehicle or object regardless of who is at fault. If the other driver is a fault, your insurance company may have a legal right to seek reimbursement from the other driver or the other driver’s insurance company. Comprehensive: This is the most popular type of motorcycle insurance. Comprehensive coverage is meant to cover and protect the motorcycle owner from any damage resulting from anything other than an accident. This includes theft, fire and vandalism. Uninsured Motorist/Under-Insured Motorist: This protects the names insured, the insured’s resident, relatives and occupants in the insured vehicle if they sustain bodily injury in an accident in which the owner or operator of another motor vehicle is legally liable and does not have insurance, or does not have enough insurance. For more information, visit us at Quoteguy.net or give us a call: (702) 251-4949.